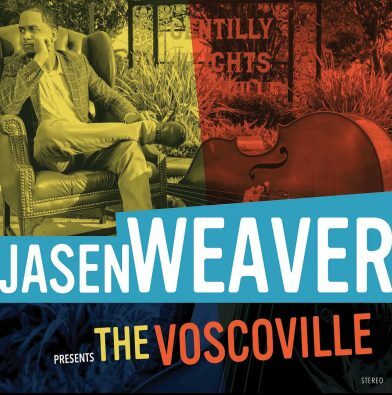 The Voscoville is the instrumental jazz recording debut of rising local bass player Jasen Weaver, a mainstay of the city’s music scene since attending the New Orleans Center for Creative Arts in high school. The influence of classic jazz here is undeniable. Listening inattentively, one could almost be tricked into thinking they were hearing a Blue Note release circa 1965, sounds evoking Wayne, Herbie, Freddie, Elvin and the like. But there are some telltale giveaways to its modern genesis: polyrhythmic superimposition that wouldn’t become part of the straight ahead jazz vocabulary until the ’80s and wouldn’t be in vogue until the ’90s, modern harmonies both close and wide blurring and blending familiar notions of major and minor, unison ostinatos between the bassist and pianist, cyclical and uneven song forms, and a crisp clarity to the production, particularly in the drums. Weaver also produced the record, surely with his ear tuned to these (literal and figurative) frequencies. The local influence is present here, too, from Weaver’s music teachers at NOCCA and the University of New Orleans, and from the city’s inexplicably little-known tradition of post-bebop jazz exemplified by a collection of tunes, the Silverbook, authored by the late influential musician, producer, and educator Harold Battiste. Weaver is also unafraid to explicitly revel in, or at least utilize, his city’s tradition for feel-good party music; the enigmatically-named title track is the only unabashedly street beat second line groove on the release, and it’s full of tongue-in-cheek, lighthearted traditional jazz and brass band quotes that help break up the intensity of the record. Nearly all of the music was written and arranged by Weaver, demonstrating not only exceptional compositional prowess, but also a level of harmonic proficiency underscored by his use of voice-leading in the horn parts. His skills as an arranger are never more evident than on the album’s lone cover and bonus track, the classic swing-era tune “Stompin’ at the Savoy,” which serves as a fitting coda to the record. In the liner notes, Weaver’s teacher-turned-colleague Jason Marsalis points out the usage of a musical quote from Ahmad Jamal on that track, fitting since the groove is purposefully reminiscent of Jamal’s classic, “Poinciana,” and further deepening the connection between New Orleans music and modern jazz. The slow Afro-Cuban groove switches to half-time swing for the bridge, where closely spaced horn dissonances adorning the melody evoke the harmonic and humorous wit of Thelonious Monk. Clocking in at over an hour and unapologetically a jazz record, many of the songs following the music’s familiar head-solos-head formula, this release is as demanding as it is rewarding. Cerebral but never mathematic and still visceral, this is the fitting, long-time-coming debut from one of the most talented bassists NOCCA, and New Orleans more broadly, helped produce.